Like many of you, I like to mix in a few extra fun activities during the month like our annual pancake breakfast or our Christmas card jamboree. Still, I take my teaching responsibilities seriously, even if I am short on time. When I need a fast, yet powerful object lesson for Christmas, I grab one of these items. During the holiday season, these objects are not difficult to find. Punch up your holiday curriculum with these seasonal items. 1. 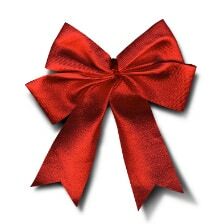 Christmas ribbons: I always have extra ribbons laying around, you probably do to. I wrap an empty box and put ribbons on top. You need one of each color: red, green, white, purple, gold and silver. Show kids the gift and remind them that Jesus is God’s gift to us. Each ribbon color has a meaning. Point to each ribbon and give kids the color meaning. 2. Christmas star: Plug in a Christmas star and hold it up for the kids to see. If possible, switch off the lights so the star really shines. Tell the story of the wise men who followed the star to find the baby Jesus. Explain that they can find him too. Hold the star a little longer and sing, “O Holy Night” together. 3. Cookie cutters: I have a collection of cookie cutters that I use to illustrate this special season. I show a star, an angel, a tree and a wreath. Talk to kids about each, relate them to the many ways we celebrate Jesus’ birth. The star is self-explanatory but also remind them of the angel who announced to the shepherds that Christ was born. Show the tree ornament and point out that later, Jesus would die on a cross made from a tree. The wreath represents the eternal promises of God, extended to us through Jesus. If you can, share some cookies you made with your cutters. 4. Baby doll: Bring a baby or a baby doll to children’s church. Wrap the doll in a blanket and tell the story of Jesus’ birth while you hold the baby. Let the children take turns holding the “baby” Jesus. Tony Kummer (Editor) reviewed & updated this page on : December 10, 2012 at 8:42 am. All our content is peer reviewed by our readers, simply leave a comment on any post suggest an update.